Ross Butler was a self-taught artist who made a lasting impression on the agricultural and art communities in Canada and the United States. Working in Woodstock, Ontario, Canada in the mid-20th century, Butler created striking idealized portraits of various breeds of livestock, and his renditions became the standard of measurement for evaluating prize animals. The Ross Butler Gallery, in the Butler family barn, Woodstock, Ontario, Canada. His works hang in many public and private collections in Canada, but the largest collection of them remains in the possession of the Butler family; his son David maintains the Ross Butler Gallery on the family farm in Woodstock, housed in the barn his father used as a studio during the later part of his lifetime. Being primarily depictions of agricultural life, it is fitting for the works to be displayed in this setting; however, over time the fluctuating environmental conditions in the building have caused some deterioration of the artworks. The Woodstock Art Gallery recently mounted an exhibition of Butler's work titled Ross Butler: Branding, Butter and Bulls, celebrating the artist's contribution to the community. In advance of the exhibition, Book and Paper Conservation Services was asked to treat several of the major pieces to be displayed. Ayrshire Cow before conservation - raking light showing planar deformation of paper. These two large pastel drawings on paper, titled Ayrshire Bull and Ayrshire Cow, are prime examples of Butler's skill and precision, and were to be featured prominently in the exhibition. However, the paper was suffering severe planar deformation and a sprinkling of mould spots was scattered across the surface of both pieces. 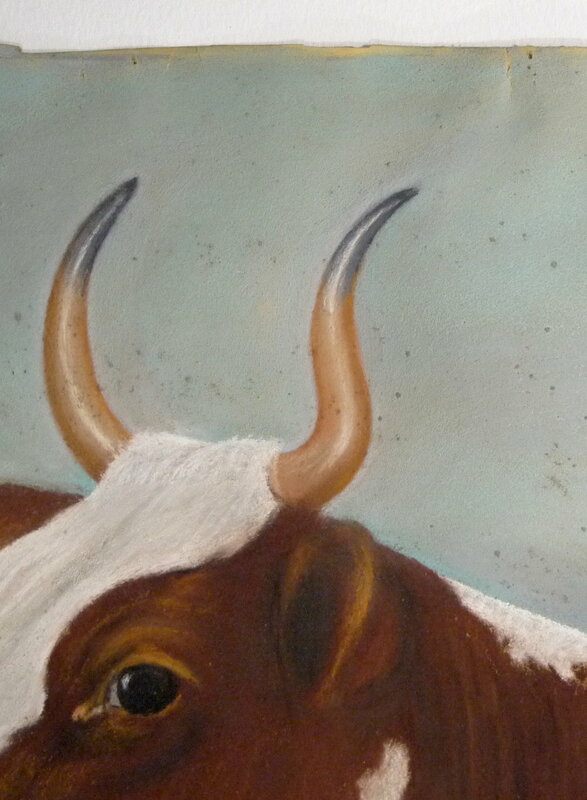 Detail of Ayrshire Cow before conservation, showing mould spots on pastel surface. Detail of Ayrshire Cow after conservation, mould spots have been removed. The paper supports had been adhered with wide swaths of adhesive around the edges of the verso to thick masonite backer boards; the tension of this constraint had caused the paper to ripple with the dramatic changes in relative humidity in the barn gallery. To address this the acidic masonite boards were removed from each piece, as well as the adhesive residue on the paper; the artworks were humidified in a controlled humidity chamber and flattened under weight. The mould spots on the surface of the pastel media were carefully removed by mechanical means, being careful not to disturb the delicate friable media. Accretions and other debris that had become trapped in the frame were gently removed as well. Removing mould spots from Ayrshire Cow. Biological remains of the barn's other inhabitants were also removed from the artworks. The artworks had been framed with care, however the powdery surface of the pastels had been placed directly against the glass, and combined with the rippling of the paper this had caused transfer of the media to the glass. Artworks had been framed directly against the glass, causing the pastel to transfer. The final stage of treatment was to clean the original frames and reinstall the artworks with acid-free backer boards, UV filtering glass and spacers to separate the art from the glass and prevent further damage to the media. We do not generally recommend a fixative for pastel media, as the solution can dull the vibrancy of the colour and affect the stability of the piece in the future. Cleaning surface dirt and grime off the original frames. Conservation treatment has stabilized these two important works by Ross Butler, ensuring their continued safety and stability. The works were installed in the Woodstock Art Gallery for the exhibition Ross Butler: Branding, Butter and Bulls, which runs from February 17th to June 30th, 2018. Curated by Samantha Purvis-Johnston, the exhibit explore's Butler's contribution to the agricultural and art communities in Ontario and across Canada. Ayrshire Bull and Ayrshire Cow on display in the exhibition Ross Butler: Branding, Butter and Bulls, Woodstock Art Gallery. Curatorial and Collections Assistant Samantha Purvis-Johnston address visitors at the opening reception of Ross Butler: Branding, Butter and Bulls, at the Woodstock Art Gallery. Book and Paper Conservation Services was pleased to work with the Woodstock Art Gallery and David Butler to restore these remarkable artworks. We encourage you to visit the exhibition this spring, and also to check out the Ross Butler Gallery in Woodstock, Ontario, which tells the story of Butler's life and work in his own environment. If you are interested in having works from your own collection conserved and restored, please contact us for more information. We invite you to browse our portfolio pages for other examples of successful conservation treatments.